Making money on Mars is a necessity when your hoverbike requires the latest upgrades and repairs. Or when you just have to have the latest in cool indie sounds. Luckily, Desert Child provides many creative ways to do so—but maybe don’t kill the kangaroos. Last week at Indie Cade’s E3 booth, Jose Acosta, D, and I played a tough, stylish racing game and RPG hybrid. Desert Child’s colourful pixelated world immediately drew me in. Its premise of earning the right to abandon an overpopulated Earth for Mars is insanely cool. The music, which we later found out is comprised of local indie musical acts from its creator Oscar Brittain’s home country of Australia, sealed my interest. Making an escape from Earth requires cold, hard cash. With limited space, buying a ticket out isn’t easy, particularly when a hoverbike is all you have to make it happen. As Desert Child’s protagonist, players get to take on a variety of odd jobs to earn money. Gameplay revolves around the hoverbike; using it race and gun down rivals in an attempt to slow them from winning. In the short session we played, we did a few races. I found it wasn’t that easy to maneuver, not for a lack of good controls but more that I had a hard time focusing on shooting and racing. Loss of ammo, restocking, and boosting proved tricky business for me. 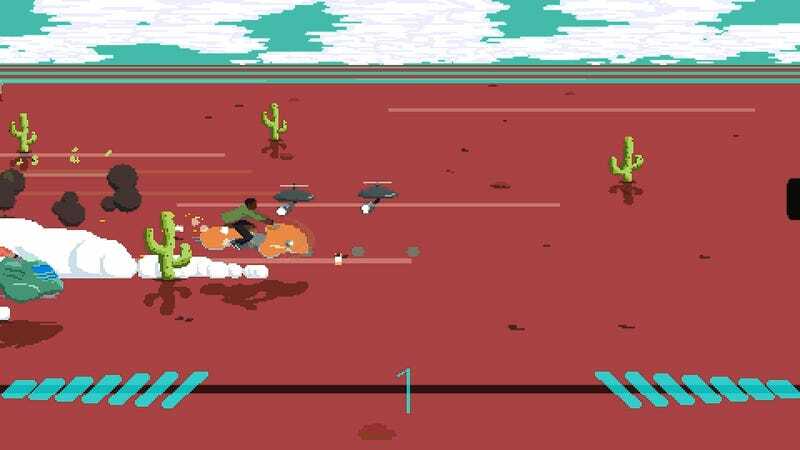 After each race, my hoverbike was heavily damaged from being shot at and by knocking into course obstacles. A damaged hoverbike means poor performance for the next mission if not repaired. It’s not cheap to do so. And with a hunger gauge to be tracked and fulfilled, money goes quickly in Desert Child. And so we embarked on a few more missions. We took on an odd job that had us just delivering pizza. The core gameplay remains the same, no matter the job, and being a delivery man was tough. But no job was as messed up and went horribly wrong as when we played environmentalists. Really awful “environmentalists”. Rounding up kangaroos for a reward was the simple objective we were tasked with. Our host on the showfloor forgot to let us repair our hoverbike ahead of the mission. Maybe we forgot as we were so excited to see the ‘roos. I should point out that Jose and I had nothing to do with what happened next, but I feel stinging guilt and responsible for the chaos that ensued. Without the ability to boost, and with kangaroos just within reach of saving but knowing it’d never happen, D gunned down the scared brown critters as they hopped away. It was the only thing he could do… you know, other than leaving them in peace. We watched in horror with a few nervous chuckles as, one by one, the little kangaroos turned to ungodly pixelated brown piles of mush. It was both revolting and hilarious. Jokingly, our host tried to get D’s name for a potential Wanted poster to be put into the game to memorialize the Great E3 2018 Kangaroo Slaughter. That’s how the incident will forever be known as: a horrific stain on my 2018 E3 memories. Desert Child’s intriguing concept set within an ultra stylish world has stayed with me in the days post E3. There’s a lot I would have liked to explore—dipping into food establishments, and spending time flipping through the music selection at the store while bemoaning how costly buying the in-game music seemed to be—but not having enough time on the showfloor to do so. I’m looking forward to how the game progresses in the future, with Desert Child currently slated as “coming soon” to PS4, Switch, Xbox One, and Steam. When it releases, I’ll be sure to save the kangaroos repeatedly as penance.